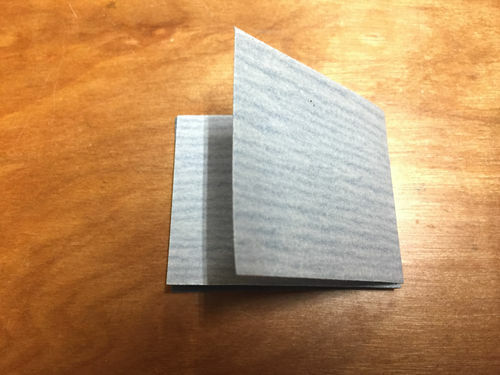 I know this seems like a trivial thing, but after folding sandpaper this way for decades, I was surprised to find only one youtube video that discussed it, and even it failed to mention the folding order needed to easily use all four surfaces of the folded sheet. 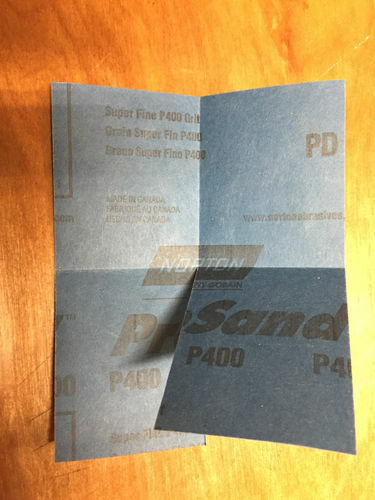 When sanding, while getting into tight places, and following contours requires a single thickness of paper, hand-sanding flat surfaces without a block is difficult with one layer. For one, there is nothing to stiffen the paper, and with just the paper backing, it tends to be slippery and difficult to manage. 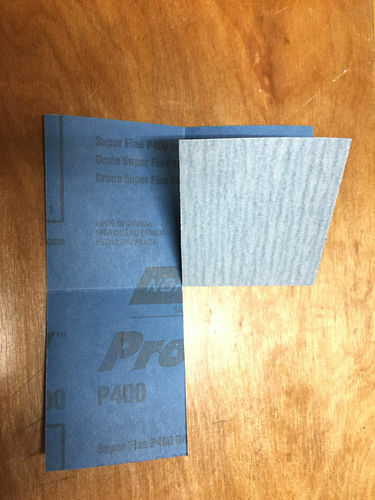 I prefer folding the sheet so that the grit is on the front for sanding and on the back for a good grip as I sand. Simply folding the sheet in half results in something that doesn’t have the stiffness I think works best. I find that a four fold method works best for me. 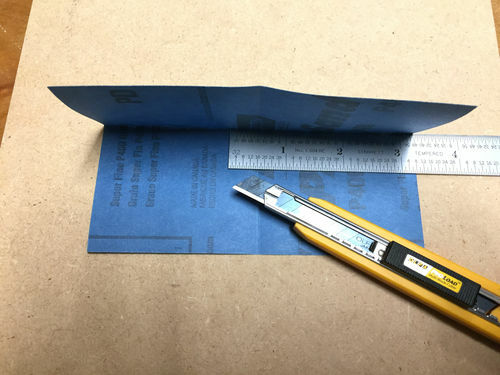 You can do this with any rectangular piece of sandpaper, but since the aspect ratio of the folded piece matches the ratio that you start with, it’s best to begin with something regular, like a full sheet, or a quarter sheet. 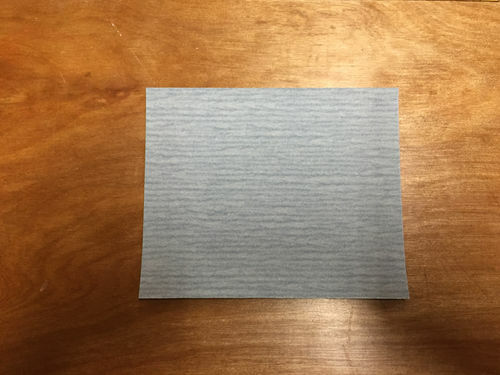 Long, thin strips don’t work so well, although there are ways to fold them too, but the result is not as solid and easy to use. Start off with your paper. I’m using a quarter sheet. 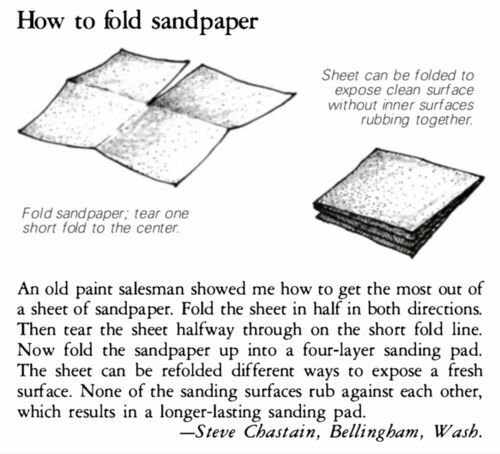 You can make your first fold either way, but I prefer to fold along the long edge. Crease that fold. Since the grit is on the outside, it’s not practical to run your fingernail along it like you might do with regular paper, so I like to use a roller. Repeat the fold in the other direction. Now cut from the center out to the edge along the longer dimension. You can go the other way too, this is just how I do it. (Here, I’ve turned it 90 degrees). 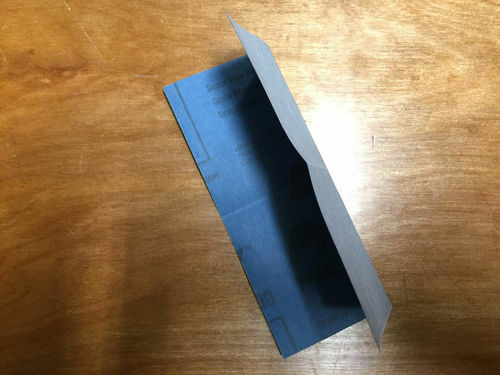 Now, fold the first flap up and crease it. And finally, fold it into its final shape. 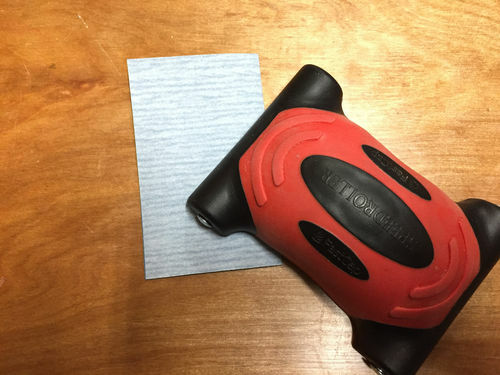 What you wind up with has grit on both surfaces and is pretty stiff, so that you can sand away, then flip it over when that side gets worn, clogged, whatever. 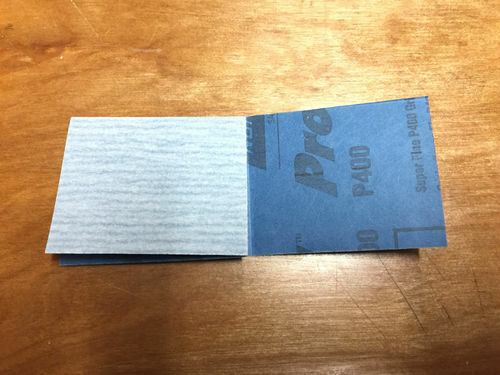 When you’ve exhausted both sides, unfold the paper and refold it so that the two unused surfaces are on the outside and continue sanding until they are spent. At that point, you’ve gotten total use out of the sheet and can toss it. Interesting, I will have to try this. Thanks. That’s a good tip. I’ll have to try it too. good tip Rich. I like that you have avoided folding grit against grit to keep the paper sharp. 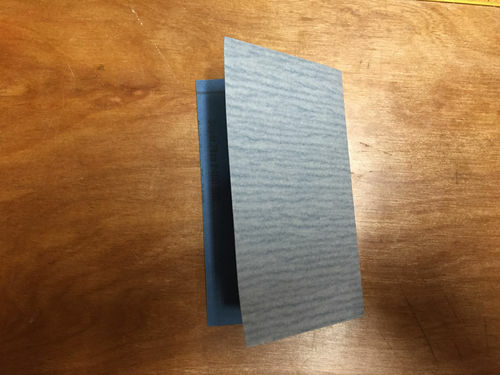 Huh – I never put much thought into my small pieces of sandpaper for corners. Usually I just sort of fold a piece into something resembling a square and go from there. This makes so much more sense that now I’m asking myself why I never thought about a better way to utilize the whole piece and not just most of it. Thanks for mentioning it, Tung. That is one of the benefits I forgot to include. I first saw this tip so long ago, I don’t even remember where.